CP Communications managed the entire RF transmission infrastructure for the event at the Shinnecock Hills Golf Club in Southampton, NY. Providing live coverage of his year’s 118th U.S. Open Championship golf tournament proved to be a daunting RF transmission challenge for Fox Sports. The network called in veteran sports production company CP Communications to manage the RF transmission infrastructure for the event at the Shinnecock Hills Golf Club in Southampton, NY. The broadcasts included more than 40 hours of live 4K and HD content delivered to 140-plus countries each day (from June 12-17). While CP Communications crews have provided onsite support for the past three years, this year’s event marked the first time that CP Communications was entrusted with the RF transmission responsibilities. This included the management of 34 RF cameras, including five RF 4K HDR transmitters for live broadcasts by Fox Sports. CP Communications also managed three RF X-Mo cameras for slow motion, on-air playback; one RF Steadicam; and four (of 21 total) HD cameras reserved for Sky, TV Asahi and other international broadcasters. To support the multi-day broadcast, CP Communications brought its HD-11 and HD-21 RF production trucks and its RF8 Fiber B-Unit truck, which accommodated Fox’s fiber-optic and communications systems. CP Communications also managed 38 miles of fiber, a MIMO mesh control system for entire course coverage — the largest-ever mesh deployment for golf, it said—and an extensive Dante audio network from Audinate with 56 RF intercom channels (using an RTS ADAM system) and 40 RF microphones across 18 holes. 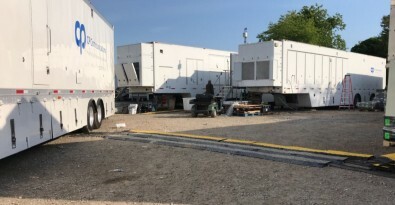 In addition, the team also handled all signal distribution, routing and troubleshooting between three CP Communications mobile trucks, two broadcast compounds, and a remote RF Communications Center. To support the multi-day broadcast, CP Communications brought its HD-11 and HD-21 RF production trucks and its RF8 Fiber B-Unit truck, which accommodated Fox’s fiber-optic and communications systems. The two RF production trucks were positioned adjacent to each other in the main broadcast center, where Fox Sports produced more than 40 hours of live, unique content across four channels each day. A split compound strategy was utilized this year, divided by a distance of over 3000 feet, to provide more space for Fox Sports technologies and staff. The remote RF Communications Center was set up near Hole 13 for managing and routing intercom channels and other audio—including 600 portable radios across more than 40 channels all tied back to the two broadcast compounds. 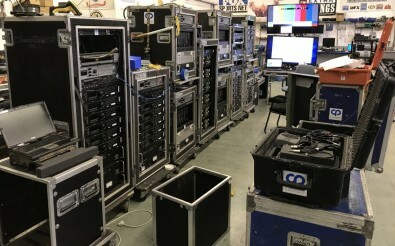 CP Communications shipped lots of gear for the 2018 US Open in pre-tested racks. Both the HD-11 and HD-21 trucks feature RF routers with a fiber interface to allow them to work in conjunction with each other. Each truck also uses MutiDyne VF-9000 fiber transmission systems to natively accept 3Gb/s (4K) and HD camera feeds over RF from Sony cameras in the field. The signals remained in pure RF across the entire architecture before being handed to the Fox Sports team in raw form. “With the 4K cameras operating in 64QAM and running 32MB/s, we were managing a very large data payload to enable the best possible 4K and HDR pictures,” said Brad Cheney, vice president of Field Operations and Engineering for Fox Sports. He continued, “If we noticed a trailing effect in the motion of a golf swing, for example, we adjusted the data rate down to 28MB/s so that the Wave Central RF encoders and decoders could keep up with the movements, and better manage the payload.